PROGRESS NEVER STOPS AND NEITHER DO WE. Real estate professionals tell us that today more than ever it is difficult to sell a home with a structural foundation problem. Settling of a foundation is due to changes in the soils after construction of the home has been completed. In periods of drought soils can dry and shrink, causing settlement of the structure. Periods of heavy rain cause wetting of the soils that cause them to soften resulting in the home sinking into the ground. Finally a home built on poorly compacted fill soils may settle due to the gradual compression of the fill. 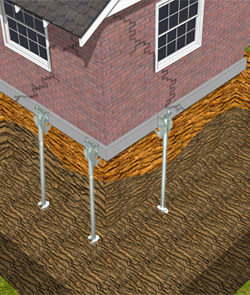 Helical piers permanently stabilize your foundation and in many cases bring your home back to level. Our heavy duty steel brackets are the simplest install in the industry. The bracket is installed below grade and will not be visible after installation. We offer light, standard and heavy duty pier designs. New Construction Foundation support - Helical Piers or Helical Anchors placed under new construction footings is the newest and most exciting trend to hit the residential construction industry. Helical Piers have been used in commercial construction and for foundation repair and utility guy wire applications for years and now helical piers are being installed under new homes in large numbers. Long gone is the myth of spread footings and shallow poured concrete piers. Helical piers are deep foundation elements recommended by engineers all across North America. Helical piers or anchors are installed below active soils so that the home is anchored in stable soils or resting on bedrock. The installation of new construction helical piers can be done in all weather conditions, no soil spoils, onsite verifiable capacity readouts, and installed quickly. This keeps your project on time and within budget. Newly constructed homes build on poor soil and compacted fill will see and should expect movements and settlements. Having a home build on a helical pier system will minimize or be non-existent with cracks and other signs of structural damage. This eliminates future settlement problems warranty issues and extends the life of the home. Peace of mind for years to come. As the building industry becomes more competitive, builders need to find faster and better methods of construction. Empire Piers provides builders with products that do just that. Builders are often provided with engineering drawings that are somewhat "light on detail" or have foundation solutions that have failed on poor soil development lots. The first step, prior to constructing the foundation should be a soils report of the building site. This report could be the best investment for your project, and in most municipalities it is mandatory to have an engineered letter on site prior to concrete being poured. If the soil investigation shows poor soil stability, helical piers are absolutely your best solid ground support. The engineered soil letter will indicate the depth the piers need to achieve to provide solid bearing support and Empire’s in house engineers can design the correct pier configuration for the structure. The helical piers are installed at intervals between the footing forms, then the grade beam pier- cap is installed and ties into the rebar grid work were loads may be applied immediately. Pouring and curing of the concrete will tie the two together allowing the footing and the pier- cap to transfer the load of the structure to the helical piers. Helical piers have become the deep foundation system of choice for architects, builders, contractors, engineers and geotechnical firms. Approved by BOCA, ICBO, SBCCI, CCMC and ICC." Don't Build without them!"